Leoš Janáček (Czech pronunciation: , baptised Leo Eugen Janáček; 3 July 1854 – 12 August 1928) was a Czech composer, musical theorist, folklorist, publicist and teacher. He was inspired by Moravian and other Slavic folk music to create an original, modern musical style. Štědroň, Miloš (1998). Leoš Janáček a hudba 20. století. Brno: Nadace Universitas Masarykiana. ISBN 80-210-1917-4. ^ Teoretické dílo, pp. 677–78. ^ Teoretické dílo, pp. 676–77. Janáček's Sinfonietta is referenced a number of times in Haruki Murakami's novel 1Q84. Janáček is the central character in David Herter's First Republic trilogy, comprising the novels On the Overgrown Path, The Luminous Depths and One Who Disappeared. Janáček composed his major piano works in a relatively short period of twelve years, from 1901 to 1912. His early Thema con variazioni (subtitled Zdenka's variations) is a student work composed in the styles of famous composers. His string quartets are at the core of 20th-century classical music repertoire. Much of his other notable chamber music is written for unconventional ensembles. Janáček's choral works, known particularly in the Czech Republic, are considered extremely demanding. He wrote several choruses to the words of Czech poet Petr Bezruč. The early orchestral works are influenced by Romantic style, and especially by orchestral works of Dvořák. In his later works, created after 1900, Janáček found his own, original expression. Leoš Janáček counts among the first opera composers who used prose for his libretti, not verse. He even wrote his own libretti to his last three operas. His libretti were translated into German by Max Brod. For the complete list see List of compositions by Leoš Janáček. Janáček came from a region characterized by its deeply rooted Universal Edition. Janáček was a pioneer and propagator of ethnographic photography in Moravia and Silesia. In October 1909 he acquired an Edison phonograph and became one of the first to use phonographic recording as a folklore research tool. Several of these recording sessions have been preserved, and were reissued in 1998. Leoš Janáček's literary legacy represents an important illustration of his life, public work and art between 1875 and 1928. He contributed not only to music journals, but wrote essays, reports, reviews, feuilletons, articles and books. His work in this area comprises around 380 individual items. His writing changed over time, and appeared in many genres. Nevertheless, the critical and theoretical sphere remained his main area of interest. Janáček created his music theory works, essays and articles over a period of fifty years, from 1877 to 1927. He wrote and edited the Hudební listy journal, and contributed to many specialist music journals, such as Cecílie, Hlídka and Dalibor. He also completed several extensive studies, as Úplná nauka o harmonii (The Complete Harmony Theory), O skladbě souzvukův a jejich spojův (On the Construction of Chords and Their Connections) and Základy hudebního sčasování (Basics of Musical Sčasování). In his essays and books, Janáček examined various musical topics, forms, melody and harmony theories, dyad and triad chords, counterpoint (or "opora", meaning "support") and devoted himself to the study of the mental composition. His theoretical works stress the Czech term "sčasování", Janáček's specific word for rhythm, which has relation to time ("čas" in Czech), and the handling of time in music composition. He distinguished several types of rhythm (sčasovka): "znící" (sounding) – meaning any rhythm, "čítací" (counting) – meaning smaller units measuring the course of rhythm; and "scelovací" (summing) – a long value comprising the length of a rhythmical unit. Janáček used the combination of their mutual action widely in his own works. Janáček always deeply admired Antonín Dvořák, to whom he dedicated some of his works. He rearranged part of Dvořák's Moravian Duets for mixed choir with original piano accompaniment. In the early years of the 20th century, Janáček became increasingly interested in the music of other European composers. His opera Destiny was a response to another significant and famous work in contemporary Bohemia – Louise, by the French composer Gustave Charpentier. The influence of Giacomo Puccini is apparent particularly in Janáček's later works, for example in his opera Káťa Kabanová. Although he carefully observed developments in European music, his operas remained firmly connected with Czech and Slavic themes. Janáček's deep and lifelong affection for Russia and Russian culture represents another important element of his musical inspiration. In 1888 he attended the Prague performance of Tchaikovsky's music, and met the older composer. Janáček profoundly admired Tchaikovsky, and particularly appreciated his highly developed musical thought in connection with the use of Russian folk motifs. Janáček's Russian inspiration is especially apparent in his later chamber, symphonic and operatic output. He closely followed developments in Russian music from his early years, and in 1896, following his first visit of Russia, he founded a Russian Circle in Brno. Janáček read Russian authors in their original language. Their literature offered him an enormous and reliable source of inspiration, though this did not blind him to the problems of Russian society. He was twenty-two years old when he wrote his first composition based on a Russian theme: a melodrama, Death, set to Lermontov's poem. In his later works, he often used literary models with sharply contoured plots. In 1910 Zhukovsky's Tale of Tsar Berendei inspired him to write the Fairy Tale for Cello and Piano. He composed the rhapsody Taras Bulba (1918) to Gogol's short story, and five years later, in 1923, completed his first string quartet, inspired by Tolstoy's Kreutzer Sonata. Two of his later operas were based on Russian themes: Káťa Kabanová, composed in 1921 to Alexander Ostrovsky's play, The Storm: and his last work, From the House of the Dead, which transformed Dostoyevsky's vision of the world into an exciting collective drama. Janáček partly composed the original piano accompaniments to more than 150 folk songs, respectful of their original function and context, and partly used folk inspiration in his own works, especially in his mature compositions. His work in this area was not stylistically imitative; instead, he developed a new and original musical aesthetic based on a deep study of the fundamentals of folk music. Through his systematic notation of folk songs as he heard them, Janáček developed an exceptional sensitivity to the melodies and rhythms of speech, from which he compiled a collection of distinctive segments he called "speech tunes". He used these "essences" of spoken language in his vocal and instrumental works. The roots of his style, marked by the lilts of human speech, emerge from the world of folk music. Janáček was deeply influenced by folklore, and by Moravian folk music in particular, but not by the pervasive, idealized 19th century romantic folklore variant. He took a realistic, descriptive and analytic approach to the material. Moravian folk songs, compared with their Bohemian counterparts, are much freer and more irregular in their metrical and rhythmic structure, and more varied in their melodic intervals. In his study of Moravian modes, Janáček found that the peasant musicians did not know the names of the modes and had their own ways of referring to them. He considered their Moravian modulation, as he called it, a general characteristic of this region's folk music. Janáček's style draws on several sources. Janáček's friend and collaborator Václav Talich, former chief-conductor of the Czech Philharmonic, sometimes adjusted Janáček's scores, mainly for their instrumentation and dynamics; some critics sharply attacked him for doing so. Talich re-orchestrated Taras Bulba and the Suite from Cunning Little Vixen justifying the latter with the claim that "it was not possible to perform it in the Prague National Theatre unless it was entirely re-orchestrated". Talich's rearrangement rather emasculated the specific sounds and contrasts of Janáček's original, but was the standard version for many years. Charles Mackerras started to research Janáček's music in the 1960s, and gradually restored the composer's distinctive scoring. The critical edition of Janáček's scores is published by the Czech Editio Janáček. Another important Czech musicologist, Zdeněk Nejedlý, a great admirer of Smetana and later a communist Minister of Culture, condemned Janáček as an author who could accumulate a lot of material, but was unable to do anything with it. He called Janáček's style "unanimated", and his operatic duets "only speech melodies", without polyphonic strength. Nejedlý considered Janáček rather an amateurish composer, whose music did not conform to the style of Smetana. According to Charles Mackerras, he tried to professionally destroy Janáček. Josef Bartoš, the Czech aesthetician and music critic, called Janáček a "musical eccentric" who clung tenaciously to an imperfect, improvising style, but Bartoš appreciated some elements of Janáček's works and judged him more positively than Nejedlý. Czech musicology at the beginning of the 20th century was strongly influenced by Romanticism, in particular by the styles of Wagner and Smetana. Performance practises were conservative, and actively resistant to stylistic innovation. During his lifetime, Janáček reluctantly conceded to Karel Kovařovic's instrumental rearrangement of Jenůfa, most noticeably in the finale, in which Kovařovic added a more 'festive' sound of trumpets and French horns, and doubled some instruments to support Janáček's "poor" instrumentation. The score of Jenůfa was later restored by Charles Mackerras, and is now performed according to Janáček's original intentions. The Janáček Philharmonic Orchestra was established in 1954. Today the 116-piece ensemble is associated with mostly contemporary music but also regularly performs works from the classical repertoire. The orchestra is resident at the House of Culture Vítkovice (Dům kultury Vítkovice) in Ostrava, Czech Republic. The orchestra tours extensively and has performed in Europe, the U.S., Australia, Japan, South Korea, and Taiwan. Its current music director is Theodore Kuchar. Janáček's life has featured in several films. In 1974 Eva Marie Kaňková made a short documentary Fotograf a muzika (The Photographer and the Music) about the Czech photographer Josef Sudek and his relationship to Janáček's work. In 1983 the Brothers Quay produced a stop motion animated film, Leoš Janáček: Intimate Excursions, about Janáček's life and work, and in 1986 the Czech director Jaromil Jireš made Lev s bílou hřívou (Lion with the White Mane), which showed the amorous inspiration behind Janáček's works. In Search of Janáček is a Czech documentary directed in 2004 by Petr Kaňka, made to celebrate the 150th anniversary of Janáček's birth. An animated cartoon version of The Cunning Little Vixen was made in 2003 by the BBC, with music performed by the Deutsches Symphonie-Orchester Berlin and conducted by Kent Nagano. A rearrangement of the opening of the Sinfonietta was used by the progressive rock band Emerson, Lake & Palmer for the song "Knife-Edge" on their 1970 debut album. The French conductor and composer Pierre Boulez, who interpreted Janáček's operas and orchestral works, called his music surprisingly modern and fresh: "Its repetitive pulse varies through changes in rhythm, tone and direction." He described his opera From the House of the Dead as "primitive, in the best sense, but also extremely strong, like the paintings of Léger, where the rudimentary character allows a very vigorous kind of expression". Sir Charles Mackerras, the Australian conductor who helped promote Janáček's works on the world's opera stages, described his style as "... completely new and original, different from anything else ... and impossible to pin down to any one style". According to Mackerras, Janáček's use of whole-tone scale differs from that of Debussy, his folk music inspiration is absolutely dissimilar from Dvořák's and Smetana's, and his characteristically complex rhythms differ from the techniques of the young Stravinsky. Janáček established a school of composition in Brno. Among his notable pupils were Jan Kunc, Václav Kaprál, Vilém Petrželka, Jaroslav Kvapil, Osvald Chlubna, Břetislav Bakala, and Pavel Haas. Most of his students neither imitated nor developed Janáček's style, which left him no direct stylistic descendants. According to Milan Kundera, Janáček developed a personal, modern style in relative isolation from contemporary modernist movements but was in close contact with developments in modern European music. His path towards the innovative "modernism" of his later years was long and solitary, and he achieved true individuation as a composer around his 50th year. Other well known pieces by Janáček include the Sinfonietta, the Glagolitic Mass (the text written in Old Church Slavonic), and the rhapsody Taras Bulba. These pieces and the above-mentioned five late operas were all written in the last decade of Janáček's life. A comparable chamber work for an even more unusual set of instruments, the Capriccio for piano left hand, flute, two trumpets, three trombones and tenor tuba, was written for pianist Otakar Hollmann, who lost the use of his right hand during World War I. After its première in Prague on 2 March 1928, the Capriccio gained considerable acclaim in the musical world. The world première of Janáček's lyrical Concertino for piano, two violins, viola, clarinet, French horn and bassoon took place in Brno on 16 February 1926. It was also performed at the Frankfurt Festival of Modern Music in 1927 by Ilona Štěpánová-Kurzová. Janáček's chamber music, while not especially voluminous, includes works which are widely considered twentieth-century classics, particularly his two string quartets: Quartet No. 1, "The Kreutzer Sonata" inspired by the Tolstoy novel, and the Quartet No. 2, "Intimate Letters". Milan Kundera called these compositions the peak of Janáček's output. The operas of his mature period, Jenůfa (1904), Káťa Kabanová (1921), The Cunning Little Vixen (1924), The Makropulos Affair (1926) and From the House of the Dead (after a novel by Dostoyevsky and premièred posthumously in 1930) are considered his finest works. The Australian conductor Sir Charles Mackerras became very closely associated with Janáček's operas. 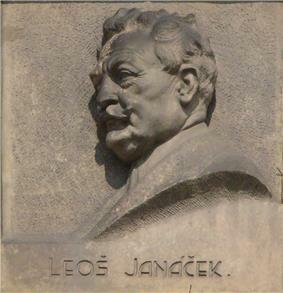 Janáček belongs to a wave of twentieth-century composers who sought greater realism and greater connection with everyday life, combined with a more all-encompassing use of musical resources. His operas in particular demonstrate the use of "speech"-derived melodic lines, folk and traditional material, and complex modal musical argument. Janáček's works are still regularly performed around the world, and are generally considered popular with audiences. He would also inspire later composers in his homeland, as well as music theorists, among them Jaroslav Volek, to place modal development alongside harmony of importance in music. Much of Janáček's work displays great originality and individuality. It employs a vastly expanded view of tonality, uses unorthodox chord spacings and structures, and often, modality: "there is no music without key. Atonality abolishes definite key, and thus tonal modulation....Folksong knows of no atonality." Janáček features accompaniment figures and patterns, with (according to Jim Samson) "the on-going movement of his music...similarly achieved by unorthodox means; often a discourse of short, 'unfinished' phrases comprising constant repetitions of short motifs which gather momentum in a cumulative manner." Janáček named these motifs "sčasovka" in his theoretical works. "Sčasovka" has no strict English equivalent, but John Tyrrell, a leading specialist on Janáček's music, describes it as "a little flash of time, almost a kind of musical capsule, which Janáček often used in slow music as tiny swift motifs with remarkably characteristic rhythms that are supposed to pepper the musical flow." Janáček's use of these repeated motifs demonstrates a remote similarity to minimalist composers (Sir Charles Mackerras called Janáček "the first minimalist composer"). His musical assimilation of the rhythm, Béla Bartók. The stylistic basis for his later works originates in the period of 1904–1918, but Janáček composed the majority of his output – and his best known works – in the last decade of his life. In 1874 Janáček became friends with Antonín Dvořák, and began composing in a relatively traditional romantic style. After his opera Šárka (1887–1888), his style absorbed elements of Moravian and Slovak folk music. In 1917 he began his lifelong, inspirational and unrequited passion for Kamila Stösslová, who neither sought nor rejected his devotion. Janáček pleaded for first-name terms in their correspondence. In 1927 she finally agreed and signed herself "Tvá Kamila" (Your Kamila) in a letter, which Zdenka found. This revelation provoked a furious quarrel between Zdenka and Janáček, though their living arrangements did not change – Janáček seems to have persuaded her to stay. In 1928, the year of his death, Janáček confessed his intention to publicise his feelings for Stösslová. Max Brod had to dissuade him. Janáček's contemporaries and collaborators described him as mistrustful and reserved, but capable of obsessive passion for those he loved. His overwhelming passion for Stösslová was sincere but verged upon self-destruction. Their letters remain an important source for Janáček's artistic intentions and inspiration. His letters to his long-suffering wife are, by contrast, mundanely descriptive. Zdenka seems to have destroyed all hers to Janáček. Only a few postcards survive. His married life, settled and calm in its early years, became increasingly tense and difficult following the death of his daughter, Olga, in 1903. Years of effort in obscurity took their toll, and almost ended his ambitions as a composer: "I was beaten down", he wrote later, "My own students gave me advice – how to compose, how to speak through the orchestra". Success in 1916 – when Karel Kovařovic finally decided to perform Jenůfa in Prague – brought its own problems. Janáček grudgingly resigned himself to the changes forced upon his work. Its success brought him into Prague's music scene and the attentions of soprano Gabriela Horvátová, who guided him through Prague society. Janáček was enchanted by her. On his return to Brno, he appears not to have concealed his new passion from Zdenka, who responded by attempting suicide. Janáček was furious with Zdenka and tried to instigate a divorce, but lost interest in Horvátová. Zdenka, anxious to avoid the public scandal of formal divorce, persuaded him to settle for an "informal" divorce. From then on, until Janáček's death, they lived separate lives in the same household. Janáček worked tirelessly throughout his life. He led the organ school, was a Professor at the teachers institute and gymnasium in Brno, collected his "speech tunes" and was composing. From an early age he presented himself as an individualist and his firmly formulated opinions often led to conflict. He unhesitatingly criticized his teachers, who considered him a defiant and anti-authoritarian student. His own students found him strict and uncompromising. Vilém Tauský, one of his pupils, described his encounters with Janáček as somewhat distressing for someone unused to his personality, and noted that Janáček's characteristically staccato speech rhythms were reproduced in some of his operatic characters. In 1881, Janáček gave up his leading role with the Beseda brněnská, as a response to criticism, but a rapid decline in Beseda's performance quality led to his recall in 1882. In 1927 – the year of the Sinfonietta's first performances in New York, Berlin and Brno – he began to compose his final operatic work, From the House of the Dead, the third Act of which was found on his desk after his death. In January 1928 he began his second string quartet, the Intimate Letters, his "manifesto on love". Meanwhile, the Sinfonietta was performed in London, Vienna and Dresden. In his later years, Janáček became an international celebrity. He became a member of the Prussian Academy of Arts in Berlin in 1927, along with Arnold Schoenberg and Paul Hindemith. His operas and other works were finally performed at the world stages. In August 1928 he took an excursion to Štramberk with Kamila Stösslová and her son Otto, but caught a chill, which developed into pneumonia. He died on 12 August 1928 in Ostrava, at the sanatorium of Dr. L. Klein. He was given a large public funeral that included music from the last scene of his Cunning Little Vixen, and was buried in the Field of Honour at the Central Cemetery, Brno. Composed in 1914, performed with success in England in the 1920s. In 1920 Janáček retired from his post as director of the Brno Conservatory, but continued to teach until 1925. In 1921 he attended a lecture by the Indian philosopher-poet Rabindranath Tagore, and used a Tagore poem as the basis for the chorus The Wandering Madman (1922). At the same time he encountered the microtonal works of Alois Hába. In the early 1920s Janáček completed his opera The Cunning Little Vixen, which had been inspired by a serialized novella in the newspaper Lidové noviny. In 1916 he started a long professional and personal relationship with theatre critic, dramatist and translator Max Brod. In the same year Jenůfa, revised by Kovařovic, was finally accepted by the National Theatre; its performance in Prague (1916) was a great success, and brought Janáček his first acclaim. He was 62. Following the Prague première, he began a relationship with singer Gabriela Horváthová, which led to his wife Zdenka's attempted suicide and their "informal" divorce. A year later (1917) he met Kamila Stösslová, a young married woman 38 years his junior, who was to inspire him for the remaining years of his life. He conducted an obsessive and (on his side at least) passionate correspondence with her, of nearly 730 letters. From 1917 to 1919, deeply inspired by Stösslová, he composed The Diary of One Who Disappeared. As he completed its final revision, he began his next 'Kamila' work, the opera Káťa Kabanová. In 1905 Janáček attended a demonstration in support of a Czech university in Brno, where the violent death of František Pavlík (a young joiner) at the hands of the police inspired his 1. X. 1905 piano sonata. The incident led him to further promote the anti-German and anti-Austrian ethos of the Russian Circle, which he had co-founded in 1897 and which would be officially banned by the Austrian police in 1915. In 1906 he approached the Czech poet Petr Bezruč, with whom he later collaborated, composing several choral works based on Bezruč's poetry. These included Kantor Halfar (1906), Maryčka Magdónova (1908), and Sedmdesát tisíc (1909). Janáček's life in the first decade of the 20th century was complicated by personal and professional difficulties. He still yearned for artistic recognition from Prague. He destroyed some of his works – others remained unfinished. Nevertheless, he continued composing, and would create several remarkable choral, chamber, orchestral and operatic works, the most notable being the 1914 Cantata Věčné evangelium (The Eternal Gospel), Pohádka (Fairy tale) for cello and piano (1910), the 1912 piano cycle V mlhách (In the Mist) and his first symphonic poem Šumařovo dítě (A Fiddler's Child). His fifth opera, Výlet pana Broučka do měsíce, composed from 1908 to 1917, has been characterized as the most "purely Czech in subject and treatment" of all of Janáček's operas. In the first decade of the 20th century Janáček composed choral church music including Otčenáš (Our Father, 1901), Constitutes (1903) and Ave Maria (1904). In 1901 the first part of his piano cycle On an Overgrown Path was published, and gradually became one of his most frequently performed works. In 1902 Janáček visited Russia twice. 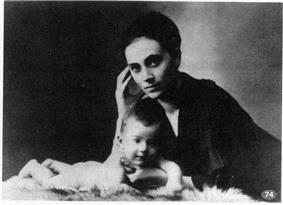 On the first occasion he took his daughter Olga to St.Petersburg, where she stayed to study Russian. Only three months later, he returned to St. Petersburg with his wife because Olga was very ill. They took her back to Brno, but her health was worsening. Janáček expressed his painful feelings for his daughter in a new work, his opera Jenůfa, in which the suffering of his daughter became Jenůfa's. When Olga died in February 1903, Janáček dedicated Jenůfa to her memory. The opera was performed in Brno in 1904, with reasonable success, but Janáček felt this was no more than a provincial achievement. He aspired to recognition by the more influential Prague opera, but Jenůfa was refused there (twelve years passed before its first performance in Prague). Dejected and emotionally exhausted, Janáček went to Luhačovice spa to recover. There he met Kamila Urválková, whose love story supplied the theme for his next opera, Osud (Destiny). From the early 1890s, Janáček led the mainstream of folklorist activity in Moravia and Silesia, using a repertoire of folksongs and dances in orchestral and piano arrangements. Most of his achievements in this field were published in 1899–1901 though his interest in folklore would be lifelong. His compositional work was still influenced by the declamatory, dramatic style of Smetana and Dvořák. He expressed very negative opinions on German neo-classicism and especially on Wagner in the Hudební listy journal, which he founded in 1884. The death of his second child, Vladimír, in 1890 was followed by an attempted opera, Beginning of the Romance (1891) and the cantata Amarus (1897). In 1881, Janáček founded and was appointed director of the organ school, and held this post until 1919, when the school became the Brno Conservatory. In the mid-1880s Janáček began composing more systematically. Among other works, he created the Four male-voice choruses (1886), dedicated to Antonín Dvořák, and his first opera, Šárka (1887–88). During this period he began to collect and study folk music, songs and dances. In the early months of 1887 he sharply criticized the comic opera The Bridegrooms, by Czech composer Karel Kovařovic, in a Hudební listy journal review: "Which melody stuck in your mind? Which motif? Is this dramatic opera? No, I would write on the poster: 'Comedy performed together with music', since the music and the libretto aren't connected to each other". Janáček's review apparently led to mutual dislike and later professional difficulties when Kovařovic, as director of the National Theatre in Prague, refused to stage Janáček's opera Jenůfa. Former organ school in Brno. Janáček lived in a small house in the garden of the villa. 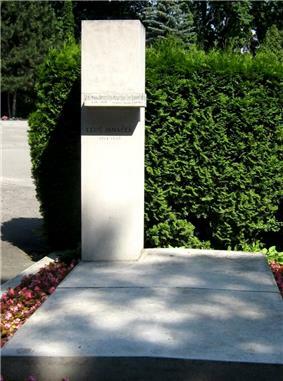 His garden house is today's Leoš Janáček Memorial. From October 1879 to February 1880 he studied piano, organ, and composition at the Leipzig Conservatory. While there, he composed Thema con variazioni for piano in B flat, subtitled Zdenka's Variations. Dissatisfied with his teachers (among them Oscar Paul and Leo Grill), and denied a studentship with Camille Saint-Saëns in Paris, Janáček moved on to the Vienna Conservatory, where from April to June 1880 he studied composition with Franz Krenn. He concealed his opposition to Krenn's neo-romanticism, but he quit Josef Dachs's classes and further piano study when he was criticised for his piano style and technique. He submitted a violin sonata (now lost) to a Vienna Conservatory competition, but the judges rejected it as "too academic". Janáček left the conservatory in June 1880, disappointed despite Franz Krenn's very complimentary personal report. 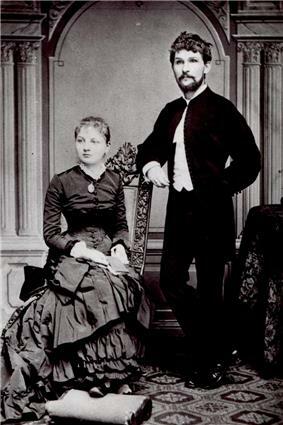 He returned to Brno where on 13 July 1881, he married his young pupil Zdenka Schulzová.